when I'm trying to load xepersian LaTeX. but I do not know how can I change pdfLaTeX to XeLaTeX. but the output does not include the shapes . From Texmaker Version 3.5.1 onwards xelatex support has been added . 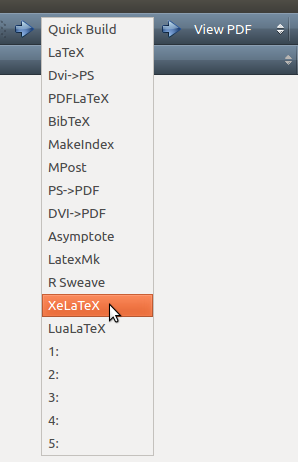 Download Latest version of Texmaker: 4.1.1 dated Jan 3 2014 that has xelatex support in standard commands like shown below. Hence there might be no need of Configuring Texmaker for xelatex with `User Commands. You will have to define a custom command in Texmaker - it's fairly simple. Hit okay and you will now be able to run the newly created command from the User → User Commands menu or by hitting alt-shift-Fn where n is the number of the command. So, for instance, alt-shift-F1 will run the command I have defined here. This may be Windows specific. It will also appear on the build menu in the toolbar, underneath everything else. Not the answer you're looking for? Browse other questions tagged xetex texmaker or ask your own question. How to introduce a few lines in Bangla font in an otherwise English document in PdfLaTex?